So much poetry these days is lacking in gracefulness. I like to think of a poem as a sort of language ballet, a lithe duration of supple and subtle written gestures. Overture, theme, digression, return, apotheosis. But wouldn’t an insistence on gracefulness limit a poet’s compositional repertoire, her expressive discretion? Yes, and the sooner the better! Poetry is an aesthetic medium. It’s high time it got back to the Orphic mysteries, to a contemplative wrestling with the dark angel of hope and beauty (that elusive symbol of meaning). Stravinsky wrote music for a graceful ballet – The Firebird. The story of The Firebird is about Prince Ivan and his complex struggle with Kashchei the Immortal. Inside Kashchei’s magical kingdom, the prince falls in love with a princess, but Kashchei won’t allow it. The prince is helped by the firebird, who mesmerizes and enchants Kashchei. 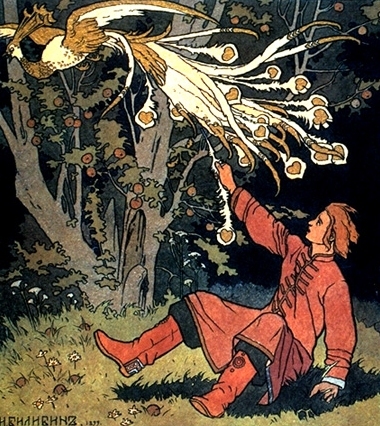 While the latter is sleep-dancing, the firebird tells Prince Ivan that Kashchei’s soul is held inside an egg. The prince destroys the egg, and the magical kingdom vanishes. Prince Ivan and the princess find themselves within the real dance of their own true time. This ballet is richly allegorical. I’ll propose Kashchei as the personification of our magical wish to live forever, to evade mortality. So in a way, Kashchei looms over us as a form of dread about death. I’ll suggest that the princess represents the possibility of our coming to terms with our natural, earthly situation. I suppose, in a way, the myth of the Phoenix also fits into this allegorical scenario. The firebird is a metaphor of our deep psychological resources for self rescue, a perpetual return to wonderment in simply being. Hence, a “resurrection” happens after our dying away from the unknowable and the implacable; a rebirth occurs into reconciled time and sufficient joy. Poet Salvatore Ala has written a poem that burns with a written grace and an indwelling fervency. That’s the Phoenix! That’s the myth! Nests in the searing winds of time. It migrates to the forests of the sun. And perches on the volcano in the ribs. And flames out like a cosmic fire. Or words that cast a burning shadow. All the world of change and substance, of melancholy and waiting becomes less burdensome when we realize the levitating art of consciousness to bootstrap being and time. We inject imagination and significance into the flowing text. While we’re alive each moment, the storybook gets stranger and more enthralling. Like the Russian ballet, a balanced momentum and a dramatic choreography vivfy Ala’s lines. The mission of the poet manifests, especially, in the concluding line: to enter the kingdom of language and bring back feathered embers for our twilit abiding. This entry was posted in Canada, Poetry, Tim Buck. Bookmark the permalink. Reblogged this on Salvatore Ala .